In a lineup crammed with star performances, Nicki Minaj was sure to be one of the most highly-anticipated superstars at the 2015 BET Awards. After a 10-minute Bad Boys Reunion and a tribute to Smokey Robinson that was at least as long, fans were fired up for a one of Minaj's signature high-energy, high-delivery performances. But if you left to get a quick snack, you probably missed Nicki Minaj's BET Awards performance with fiance Meek Mill and Chris Brown for their hit single "All Eyes On You." Minaj won five BET awards last year (and has a total of eight to date), and stands to add quite a few more to her collection at the 2015 awards. Her Minajesty ties Chris Brown for the most nominations of the evening with her six possible nods including, Best Collaboration, Best Group, Best Female Hip-Hop Artist, Coca-Cola's Viewer's Choice Award and Video of the Year for “Anaconda.” So far, she's taken home Best Female Hip-Hop Artist, beating out Azealia Banks, Dej Loaf, Iggy Azalea, Tink, and Trina. But the real contest will be for Video of The Year, where smash hit “Anaconda” will face off against Beyonce’s “7/11.” The Barbies versus the Beyhive, and either way, we all win. No need for bloodshed, guys. The Trinidadian recording artist is finishing her 49-city Pink Print tour this summer. This is her third tour, with stops across Europe, the U.S., and Canada. On Friday, Minaj performed at the Staples Center as part of the weekend-long BET Experience. Some said the Friday night show felt hollow and dry, like a dress rehearsal. If that was the case, Sunday night’s performance should have been her main event. 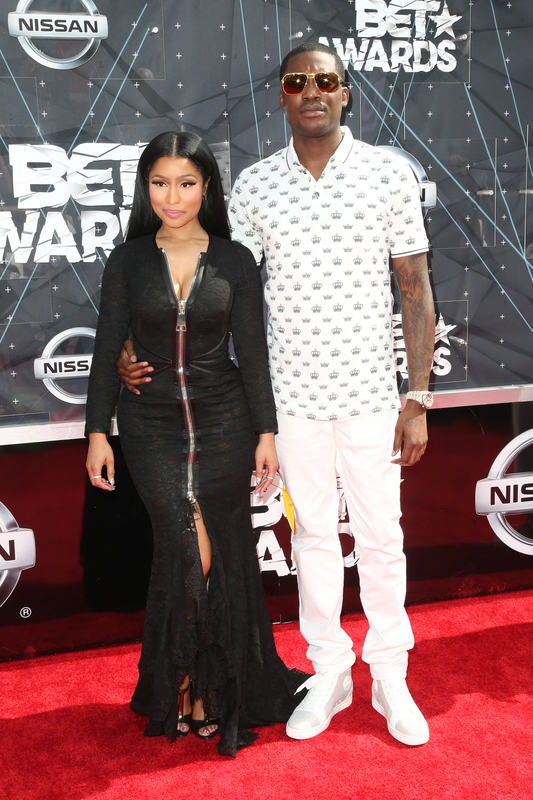 I think we can agree that Minaj and Mill make an adorable couple. They looked so amazing together that Twitter barely seemed to notice we'd only been treated to a split-second performance. But I for one could have used another 15-20 minutes of Nicki. No "Anaconda"? No "Truffle Butter"? I guess we just have to be satisfied with a glimpse of the happy couple. Watch the too-short performance below.